For local advertising rates, contact Kris Wendtland at 303-902-7276 or advertising@coloradocountrylife.org. For national rates, contact American MainStreet Publications at 800-626-1181 or amp.coop. 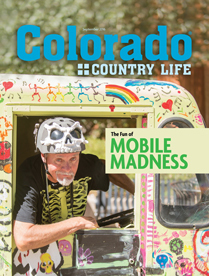 Colorado Country Life is the official publication of the Colorado Rural Electric Association. Articles cover local, state and national rural electric issues and other topics of interest to people living in rural Colorado.